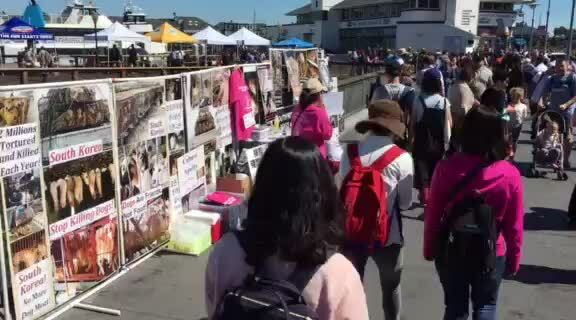 We’re here to speak out for the millions of dogs and cats horribly mistreated and killed in South Korea every year as food for human consumption. Not because people are poor and hungry. South Korea is a wealthy nation. They have a choice but the greed of the dog meat trade and their profound indifference to the immense suffering of these animals perpetuate this practice. Dogs are crammed into filthy cages without proper food and water. They are given rotten food waste contaminated with maggots, mold, and often toothpicks, as food. They stand on wires with their bare paws every day. They don’t even know what it feels like standing on ground. Even in scorching heat, they don’t get water. Even in freezing snow, they are stuck outdoors in cages. Many of them are frozen to death in their cages during the harsh Korean winters. Imagine their pain, agony and fear. Their lives are a never-ending nightmare. They are beaten to death, electrocuted, hanged, and often boiled in water while still alive. They hear and witness their friends being slaughtered right in front of them, knowing that they are next. The Korean dog meat industry makes money from cruelty and suffering and the Korean government does nothing about it! We are NOT talking about a few people eating dogs behind doors. We are talking about a billion-dollar industry operating with their government’s blessing. Don’t let the Korean government avoid its responsibility to animal welfare. South Korea is not a poor country. It is one of the wealthiest industrialized nation in the world with the highest level of education. This should not happen in any nation, especially not in South Korea – the home of Samsung, Hyundai, Kia, LG, and SK. We are speaking out to expose Korea’s shameful and inhumane dog and cat meat industry, and to stop the Korean government from ignoring animal cruelty. If we don’t speak out, nothing will change for these dogs and cats in South Korea. Please sign our petition demanding South Korea to stop the dog and cat meat industry permanently! It only takes 2 seconds to sign our petition. If you don’t speak for these animals, who will? Millions of dogs and cats in South Korea are living in hell today and desperately waiting for you to speak for them. Please go online to KoreanDogs.org and take action and help fight this cruel industry. You can make a difference. You can help save the poor dogs and cats of South Korea. 대한민국의 개, 불쌍한 누렁이를 살려주세요. 잔인한 악습! 개 고양이 식용을 반대합니다. 대한민국은 개식용을 중지해주세요. 반려동물식용, 이젠 사라져야 할 악습입니다. 식용견, 애견이 따로 있지않습니다. 모든개는 반려견입니다.